When I moved into my home and contemplated the vast amount of furniture I'd need to purchase in order to make it a 'home' I vowed that I wouldn't just buy anything to fill the space - I'd wait and purchase pieces that I really liked, and hopefully I'd be able to find pieces I liked at a price point I could also afford!! Given my unit is only a one bedroom, when considering the purchase of a sofa, I decided that a sofa-bed would be my best choice. There was only one problem - have you seen what's readily available in sofa beds?? UGLY!! Eventually (after months of looking) I found a sofa that really liked - Yay! 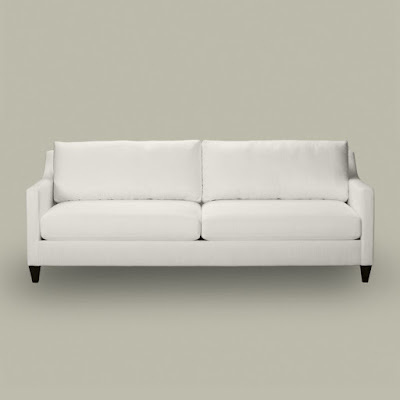 It's the Monterey Sofa from Ethan Allen, and I fell in love. Unfortunately they don't make it in sofa bed - Boo! The next step in my sofa search was the realisation that in order to get the sofa style I wanted, in the format I wanted - I was going to have to go custom. Oh boy - did I ever underestimate just how difficult a process this would be. The first problem was I had no idea where I could get a sofa made. A Google search solved this fairly readily - of course sofa manufactures are not located in Midtown Toronto - they're all in the suburbs. This was a wee problem as I don't have a car. Let's just say I became quite familiar with a few of the GTA's transit systems during my quest. The second issue was the actual choosing of fabric. The designers make it look so easy on all those shows on HGTV, but for people like me with no design training it's a little bit of a nightmare. I'd select some fabric that I thought would work, schlep a sample home only to discover that the shade changed completely once in my space. Part of the problem was I'd already purchased a rug which is a bit of an odd colour - not gray, nor blue or green, but somewhere in the middle, and finding a fabric that didn't clash was surprisingly difficult (It's even more surprising when you consider I was looking for a beige fabric - who knew beige could clash with anything?). At the start of June, after several weekend jaunts to the dreaded suburbs, I'd finally chosen my fabric and was told my sofa would be ready in 6 - 8 weeks. I figured at this point the hard part was done - I was wrong. Six, and then eight weeks went by, and still no call from the manufacturer to arrange for delivery. When I called them I was told there had been a delay in receiving the fabric, but I'd get my sofa in 2 weeks. Okay a small delay, but nothing to get too worked-up about. Three weeks passed. Four. 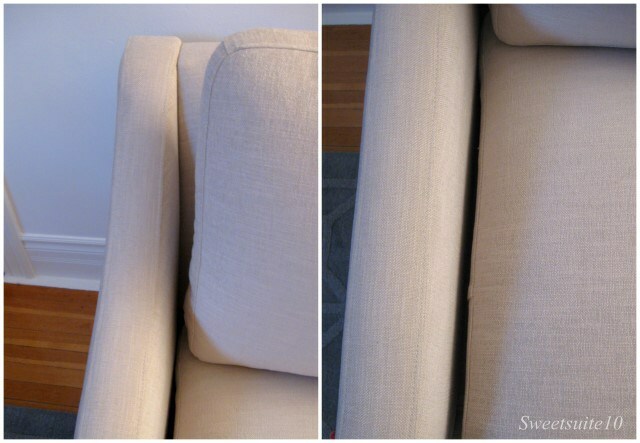 I finally got the call that my sofa was ready (Hallelujah!) and arranged for it to be delivered. I should probably admit something here - delivery services make me uncomfortable. Not because there's some strange people in your home, but because I always feel really stupid just standing there - I feel like I should be helping. I know it's their job, but still I feel weird just watching them lift and carry my stuff. That's right - I hole right there on the front of my very tardy, newly delivered, pricey sofa. As there wasn't anything the guys could do about it, they took their leave and advised me to call the manufacturer in the morning. I admit it was a small hole, and I'm sure some would have just lived with it, but I knew I just couldn't (remember the problem I had with the hole in my foyer wall?). To this day I don't understand how they missed the fact that the pillows were the wrong size. In an effort to make this massive post shorter, the guys came back for the sofa and at the end of October I got a call to say it was fixed and ready for delivery. Given the issues I'd had before, this time I went there to inspect the sofa first before it was delivered - I figured that as much of a pain traveling to the suburbs was, it was less painful than watching two guys deliver a sofa again only to have to again send it back. This attempt was much better. On Monday November 1st, only 5 months after it was first ordered, my sofa finally took its place in my living room. Am I completely happy with it? Honestly? No, but I finally reached the point where I couldn't think about it any more. One thing I do know - if I ever decide to buy another place, one item on my 'must have' list for the real estate agent - a living room that will fit this sofa - there is NO WAY I'm ever purchasing another one! Once was quite enough thank you! 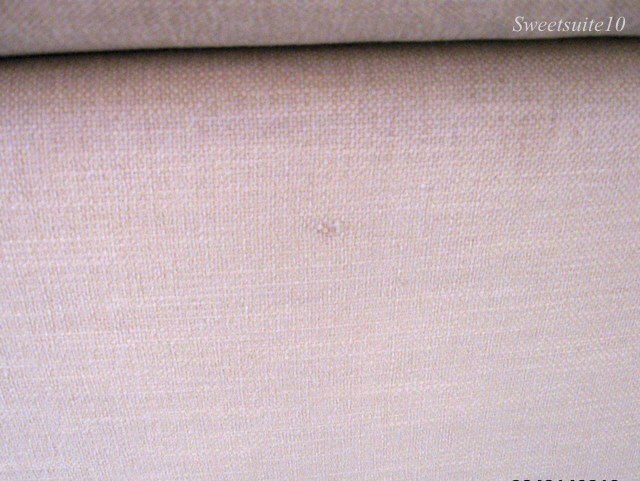 Hi Michelle, I am thinking about ordering Ethan Allen Monterey Sofa, but can't decide the fabric color. Could you please be so kind and let me know your fabric color? Thanks a million!!! 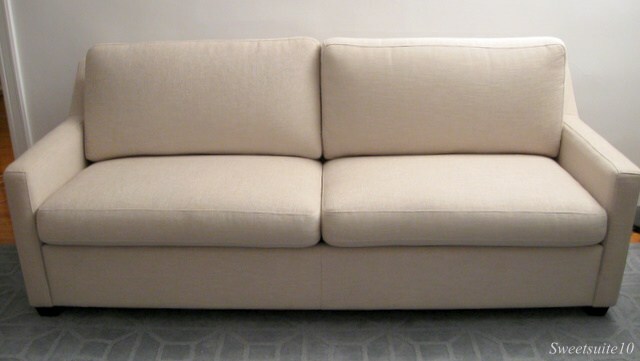 The sofa I bought isn't actually from Ethan Allen - it was custom but inspired by one by Ethan Allen. The fabric was therefore one I chose from the thousands at my upholsterer. Would you like me to see if I can find out the name? House & Home - March 2011 - Spotted!